Parlor palm trees (Chamaedorea elegans) are native to Mexico and Guatemala, and are known for their single-stemmed elegance. These palm trees prefer shady locations. A parlor palm tree adds elegant tropical beauty indoors as an exotic house plant, as well as outdoors in the garden or landscape. Chamaedorea elegans (also known as Parlor Palm, Table Top Palm, and Neanthebella) belongs to the Arecacea family, and can be planted year round in USDA hardiness zones 10B through 11. If you live in a cool climate, this palm tree can be displayed outdoors in a container during the warm months, and then brought indoors during the winter. Parlor palms reach a height of four to eight feet tall, with a spread of two to three feet wide. These medium green, single-stemmed palm trees look best when several stems are planted together in groups. The single stems are topped with elegant palm fronds that are light to medium green in color. The evergreen leaf blades are 4 to 8 inches in length. 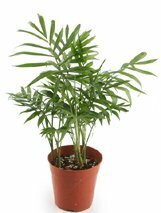 These table top palms are popular as house plants, and can be planted in containers or above-ground planters for display in the garden or landscape. Parlor palm trees are the perfect indoor palm to accent an entryway, or display in an elegant room of the house that receives little sunlight. They are easy to grow indoors, and thrive with minimal care. Lighting - Choose a location that receives light to moderately bright light. Too much sunlight will cause the leaves to turn yellow-green in color. Temperature– The ideal daytime temperature ranges from 65°-75° F. Evening temperature should not fall below 55° F. Keep palm away from areas near hot or cold drafts. Humidity – Parlor palm trees require moderate to high humidity. To provide adequate humidity, spray palms with water several times a week, or place plant container on a saucer filled with pebbles and water (water should be just below the pebble level). You might consider placing a room humidifier near the plant. Soil & Fertilizer – You can use a regular potting soil with coarse sand or peat added into the mix. Feed monthly during spring and summer with a slow-release fertilizer. During fall and winter, fertilize every two to three months with a liquid fertilizer diluted to ½ strength and mixed into water. Watering – Parlor palms require a thorough watering. Water this palm tree until the water seeps out the drainage hole in the bottom of the planter. Make sure there are no dry spots left in the soil. During winter the best time to water this plant is when soil becomes dry to a depth of two inches down from the surface. Re-potting - Increase the size of the container by 3 to 4 inches to provide plenty of room for the root system when repotting parlor palms. Tip: Clean leaves with a damp cloth every two to three weeks to keep them dust-free. Parlor palms thrive in tropical climates, and can be planted year round in hardiness zones 10B-11. They can be planted outdoors in a container or above-ground planter, and make an exotic accent when planted as a ground cover in a small garden or landscape space. Be sure you choose a location with partial to full shade. If planted in a container, this palm can be brought indoors for overwintering (necessary if you live in a cold climate). Plant in a location with fertile, well-draining soil. Fertilize once a month during the growing period with a slow-release fertilizer. Water thoroughly, keeping soil evenly moist during the growing period. During winter, water when top two inches of soil is dry. Parlor palm trees prefer moderate humidity.